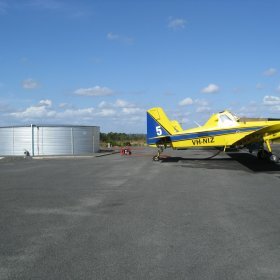 REHBEIN Airport Consulting was commissioned by the Shire of Manjimup to undertake a study of the airport infrastructure requirements for the town of Manjimup in Western Australia. The study had to identify the facilities necessary to accommodate future aviation activity driven largely by potential future Fly-In - Fly-Out (FIFO) operations by resource sector companies transporting personnel to mines in the Pilbara. Facility requirements for possible future airline services and existing general aviation users also had to be accommodated. The highly constrained existing airport site was considered alongside a potential alternative Greenfield site. Both sites were assessed on their ability to accommodate the required infrastructure as well as their potential for providing land with the potential to be developed commercially. Layouts were developed for both sites and the advantages and disadvantages of each considered together with the capital cost for the development of each site. In relation to the existing airport site, the lack of available land for development meant that full compliance with regulatory requirements was difficult to achieve. Options for exemptions to certain standards, in particular runway strip width, were investigated with CASA to understand the parameters within which a safety case for an exemption would be likely to be accepted. It was concluded that the operational requirements for FIFO services would have made a safety case unlikely to be acceptable. Runway length requirements for the aircraft types required to make direct point-to-point services viable would also have been extremely costly to achieve. Validation of the capability of the existing site in particular required a much more detailed assessment of the relative layout of various facilities than we had anticipated in our tender proposal. Nevertheless, through flexible management of our agreed scope within our lump sum fee we ensured sufficient resources were devoted to these critical tasks to define a robust layout and give confidence that the desired operations would be feasible within the existing constraints. However, the capacity of the existing site to absorb further expansion of operations would have been exhausted. Therefore, on the basis of cost and longevity, development of the alternative site was the recommendation, which the Shire subsequently adopted. Based on the results of our study the Shire of Manjimup was able to make an informed decision about the best airport site for future development and take advantage of the availability of potential funding sources for its development.